The waters off of Hawaii are full of some of the most amazing sea life in the world. It is home to lovely corals, stunning and plentiful fish, spinner dolphins, whales (albeit seasonally), and our personal favorite the Honu, or sea turtles. 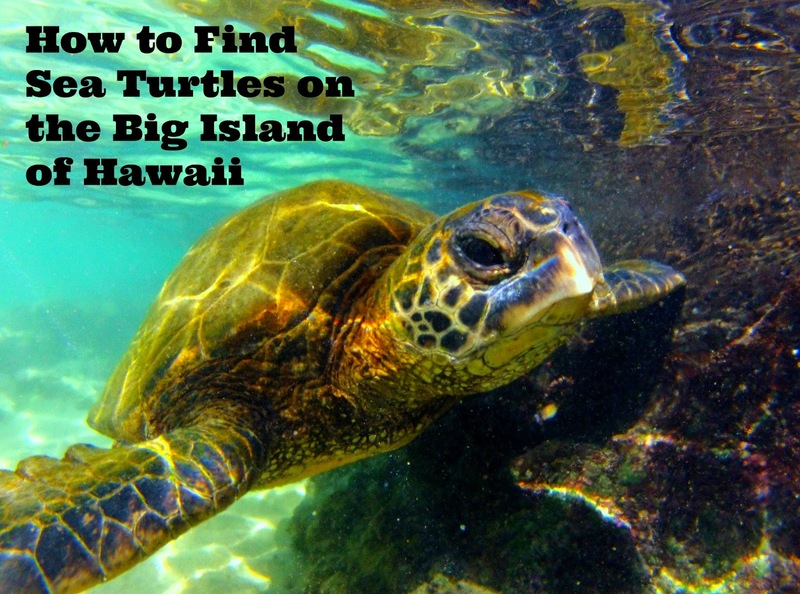 Since my post on how to find sea turtles on Oahu was so popular I thought I would write one up for the Big Island as well. It's all good and well to know they are around but unless you know where to go that doesn't do you much good! 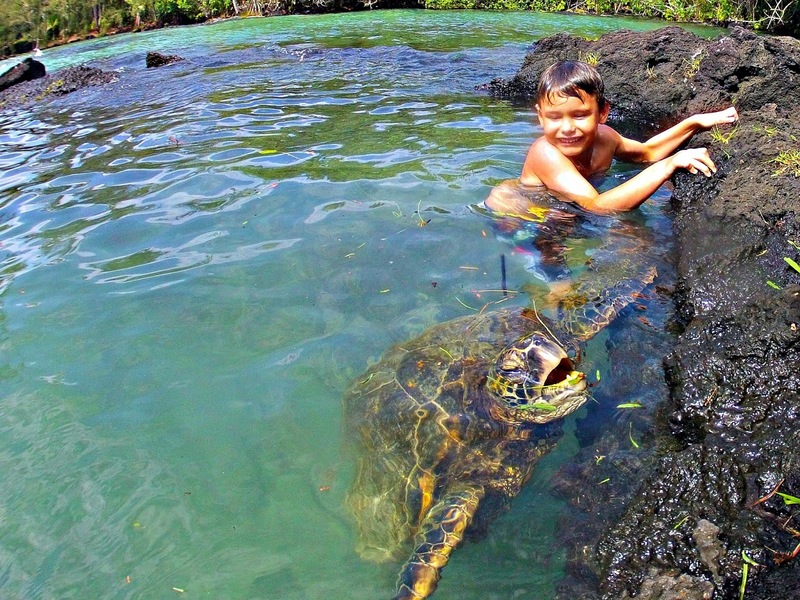 We have seen even more turtles here than on Oahu and although you are not legally permitted to touch them we have found them to be very fond of touching us particularly in the Hilo area. I guess they have more aloha towards humans on this island. The nice thing on this island is that there are not near as many tourists so you have a much higher chance of getting to experience these beautiful creatures in peace. So jump in your car and follow me around the island to all the spots you are most likely to see sea turtles on the Big Island of Hawaii. I live on Hilo side so we'll start on there and then head over Kona side where you can also experience sea turtles but they seem to be slightly less common. If you are visiting, renting a car is a cinch and really necessary for full enjoyment of the island. Everything from a Ford Focus to Mustangs to Jeeps and minivans are available so take your pick and head out! This beach has the most friendly sea turtles I have ever seen. Located just behind the airport in Hilo this beach is easy to access, has bathrooms and picnic areas and although parking is somewhat limited the beach area itself is really spread out so there is plenty of privacy and space. Every single time we have visited Carl Smith we not only see turtles, we are generally accosted by them. We never touch or harass the turtles as it is illegal in Hawaii to do so but they just can't seem to get enough of us! They swim nearby and seem to cuddle up to you if you stand still long enough. We were a little uncomfortable at first as a couple of them are huge but you quickly realize how gentle and sweet they are. Tip: When you get there head over to the right hand side of the park. The water overall is pretty chilly but on that side it is warmer and the turtles seem to congregate there. Now Alahanui does not see the same level of turtle action as Carl Smith but we do regularly spot turtles there in the open ocean outside the protected pool area. You can find the hot ponds on the Red Road in Puna, near Pohoiki beach. It is really the only other spot on Hilo side that we regularly see them. The cool thing about the turtles here, and I kid you not, is that they love surfing. Head over to the wall between the protected hot pond and the open ocean and look out to the waves. After a little while (they don't hold their breathe too long so you'll see them pop their head up to breathe) you will see them literally surfing the waves. It is one of the cutest things I have ever seen. Tip: The water is pretty rough beyond the pool so please be careful and heed all warning signs. There is plenty of viewing area that is still safe. Punalu'u is located on the South East shore of the island about 1 hour past the entrance to the Volcano park. It can get very busy during holidays and weekends so I suggest going on a weekday if you value privacy at all. The beach is easy to access and offers not only a beautiful beach and ocean entry but also a small freshwater lagoon full or tadpoles and fish, small kids love it and it is a nice spot to rinse off the salt water! The park also has food and drinks for sale as well as bathrooms. OK for the important part...the turtles! You basically don't have to do anything. Most days there will be a large hawks bill or green sea turtle or 2 just lazing on the shiny jet black sand (formed from crushed lava rocks). Remember to keep a distance of 15 feet from the turtles and do not touch them as they have no immunities to the germs we carry. If you are lucky you may also see them swimming just off shore in the frigid spring fed water. Tip: Do not take any sand or lava rocks. It is said to bring bad luck if you remove the items from the island and many people end up returning to Hawaii just to bring it back and reverse their luck. This Kohala coast beach has a little bit of something for everyone from tide pools to rock formations to an abundance of sea turtles. There is a lot of seaweed growing in the bay and that attracts the turtles so at times there can be loads of them. The water can be chilly especially in the winter. Yes really, Hawaiian waters get a bit brisk, I swear! The beach is located between mile markers 82 and 83 on the Kona side. It is a narrow gravel road but we had no problem on it with a 2wd minivan. The lagoon is nice for snorkeling and swimming for little guys as it is much calmer than the open sea is. There are also ponds located to the North and South of the bay but they are on private property so not accessible. The turtles have a base there but we always see them in the lagoon as well. Tip: Be careful as they are also very friendly, not as much as the big guys at Carl Smith Beach but they do approach you and I have seen a lot of kids quite frightened by that. We love this beach park! It suits our family really well even though there is not much to the actual beach. I find the sand to be pretty pebbly. The park provides bathrooms and showers as well as food and drinks most days. The water is very calm on the Southern side because of a rock wall that protects the cove from surf. 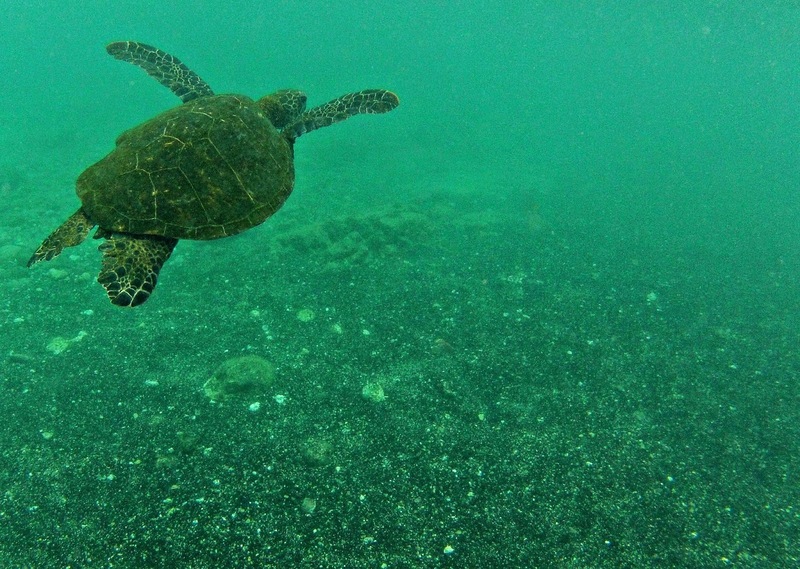 You will also see turtles sunning on the rocks as well as out snorkeling with you. We have been to this beach at least 10 times and have seen turtles every single time. 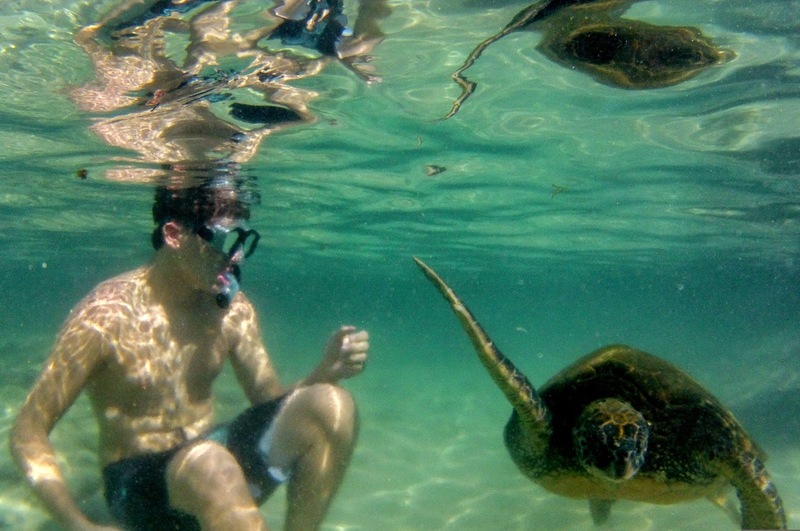 It is one of the best snorkeling and turtle observing beaches on the island! If you have older kids or want to try surfing yourself there is also a great beginners break just to the North or left of the main beach where you can rent a board and have a blast without getting wrecked by large waves. Tip: Be careful of your feet in both areas. I know reef shoes are not the coolest looking of all footwear but it helps greatly for getting in and out of the water as well as avoiding the dreaded sea urchin sting! Many people ask which side of the island they should stay on. The entire island can be accessed no matter what side you stay on but the drive times are long. If you are here as a tourist with a limited time frame I would suggest Kona side. The beaches are plentiful, turtles are all over the place, and although Hilo is a cute town I think Kona side is a bit nicer for a week or 2 visit. There are great vacation rentals in the area as well as hotels to fit every budget, well almost any budget anyway! Have you been to the Big Island yet? 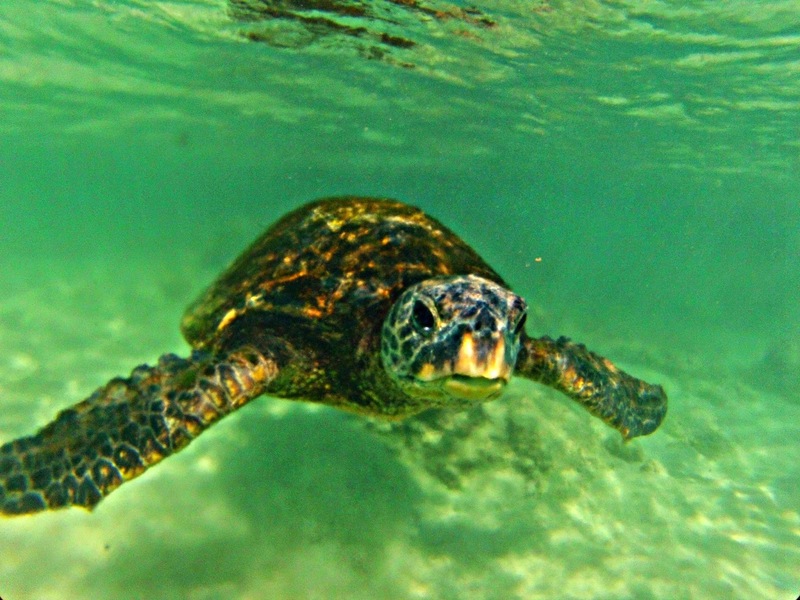 Did you see any of our beautiful Honu?